Looking for a shot shell that packs a punch? 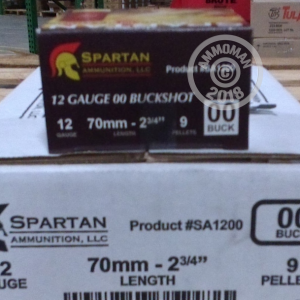 Look no further this 00 buck shot shell by Spartan -- it's a great, economical option for all shooters. Whether your shotgun is for personal defense or taking down large deer, this Spartan load is designed for tight shot patterns and delivering a forceful blow on your target. These shells are also compatible with drum mags. Spartan ammunition is manufactured in Italy. Buy this case and save big with AmmoMan's Free Shipping on all orders over $99! we are very happy with these rounds for our beloved mossberg 9200. Even my wife liked these shotgun rounds. Will definitely stop an intruder in their tracks. Thank you for providing a quality product at a reasonable price.